Mashael Group recognises the value of developing a highly motivated and efficient workforce. We encourage and provide avenues for our employees to continually upgrade their technical and soft skills. Ultimately, our people are the ambassadors of our company. Their excellence reflect our excellence. Mashael Group also prides itself as an "equal opportunity" employer. Last but not least, we strive to adhere to best practices and standards to ensure the safety and health of our employees. Protecting the world that we live in is a fundamental obligation of any corporate citizen. We take this seriously and believe that minimising the impact of petroleum consumption to the environment goes hand in hand with sustainable economic growth. In fact, we take it one step further - by literally making it our business to protect the environment. In addition, Mashael Group is the proud corporate sponsor and contributor to various environmental awareness campaigns and initiatives. We are proud to play our role in making the world a cleaner and safer place. Wherever we are, Mashael Group looks to maximise our positive impact on the community around us. Either simply by providing job opportunities or promoting fund raising events, we strongly believe in giving back to the community. Additionally, we make a conscious decision to only participate in projects that enhances the well-being of our surrounding and wider community. 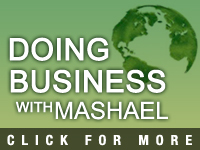 To us, Mashael's growth is ultimately linked to the prosperity around us. We call this growth and success via "community development". The Mashael Group's strategies follow a strict competition policy - where efforts to collude, coerce or similar methods to gain unfair market advantage are prohibited. We strongly believe that a competitive market will bring out the best performance from the market participants and thus benefit the consumers and customers.